I am a list builder. I break projects down into their most granular tasks and write them down in a to-do list on an old school scrap of notebook paper. If you look around my desk, folded and tucked neatly reused as bookmarks into books on my shelf, and in my round file cabinet (aka the trash), you’ll find them everywhere. Using to-do lists is reinforced everywhere on the web. The tech industry, in particular, is obsessed with the cult of productivity and to-do lists. There are posts on the 5 best to-do list managers, not-to-do lists, and there are apps for that. For each area of my life there became a list. Chores around the house. Workouts. Client projects. My own sites. General family stuff. It evolved into stacks of tiny paper monsters hounding me for all that I hadn’t gotten done, regardless of what I had accomplished. When your life lists get too big it dilutes the positive association of forming a list in the first place: crossing items off. Coupled with the time I was spending writing down things I wanted to do, it became clear that the action of writing them down was just another form of analysis paralysis. On a lark I stopped writing to-do lists down about 18 days ago. Instead, I just started doing things. And, in a worn moleskin notebook- the same to which I had put all those elusive ideas and former albatross lists of things I wanted to accomplish- I started writing down what I HAD DONE that day. The crazy thing about turning your list-making from abstract tasks you’d like to get done vs. things you have actually done each day is the added reinforcement of accountability. In the last two weeks I have become maniacal about assaulting projects so that I could record them in my tiny notebook. The list size has dropped tremendously; some days 8 items- a few just 2. But it has given me focus, responsibility and a tangible daily measurement of progress. That coveted idea called productivity. The proof is in the pudding. I launched new projects. My billable time went way up. I began building out domains that had been dormant in my account for the better part of a year. I stopped flaking out on friends, phone calls, and began returning emails the same day. Workouts became regular and progressive. Most importantly – I became much more present at home. My time on Skype and AIM went from almost all day 7 days a week to a 2 hours a week, max. I broke the Top 10% barrier on my Rescue Time Dashboard. The relentless pursuit of becoming more efficient and getting things done readjusted my priorities. I spend a lot less time wasting time and a lot more time trying to add things to my tiny notebook of accountability. Maybe not. You have to find what works for you. But if my last two weeks are any indication, 2011 is going to be a banner year. If you’re struggling under a mountain of to-dos, give the reverse to-do list method a shot. The newfound productivity may surprise you. I’m genuinely interested to see if anyone else has a productivity hack that works for them. That is EXACTLY what I needed to read this morning. Struggling with everything that I need to get done and you put it so succinctly that I can’t avoid it. Thank you for your reverse wisdom. Now, I simply need to figure out which scrap to write down my accomplishments on. ;-) Kidding! Let me know how the method works out for you after a week if you do try it. I have To-Do folders in Thunderbird for just these reasons. Instead of writing down everything I need to do all the time, I just break down all email into categories and sub-categories (and sub-sub-categories, etc.) with a “To Do” sub-category for each of the parent ones. For a while I fell off this wagon and my Inbox got out of control, but yesterday I tamed the beast and I now have buckets of tasks to just start doing instead of trying to figure out what should be on the agenda. Thunderbird is superior to the Gmail inbox for that reason- subfolders and subcategories and a much more fluid interface so it doesn’t all get buried. I’m fascinated by this kind of stuff. Have to admit that I don’t think this process would work for me, but I can certainly see how it helped you get more stuff done. Having accountability is a big motivator to get things done. Personally I took a lot from David Allens book “Making it all Work” which was a followup to getting things done. My system now is a daily and weekly review of my tasks and overall goals. I write my to-do list at the end of each day which means I leave work with a clear head an know that when I come in the following morning, exactly what I need to do is already defined. Also I only write down a todo list of 5-6 things per day which really allows me to focus and its a great feeling to get them all ticked off. It sounds like you have a system in place that’s working- which is awesome. Your point that 5-6 things per day “really allows me to focus” is key, I think. I can’t remember where I read it exactly, but I think Tim Ferriss mentioned a method of folding up a piece of paper 3 times and your to-do list on any given day can’t exceed the size of one of the folds. It’s another hack, but the point of limiting what you set out to do probably goes a long way in the satisfaction you feel of actually getting the individual items done by the end of the day. I am a huge fan of GTD and just finished reading Making It All Work yesterday. Amanda focuses on moving from organizing your tasks to actually doing them. Reviewing what you have done gives you a sence of accomplishment and inspiration to do more. If you see your billable hours going up and you see that your friends are thrilled that you are not flaking out on them anymore – that’s even more inspiration. Organization of your tasks and planning is just setting the stage for doing. The actual doing is the most important part. GTD helps you do more and prioritize. Nothing will help if there is no action. I’m going through something similar right now. I realized in February that I wasn’t starting any new projects because I had committed to all these other projects that I wasn’t finishing. What I decided to do this month is make a list of all those in-limbo projects and just… do them. Anything that doesn’t get done by the end of the month, I’ll drop. April will be a fresh start. That’s a great idea. I love the part about wiping it clean if it doesn’t get done by the end of the month. As I said to Michelle below, it’s a form of self-selecting prioritization. If it’s not enough of a priority to get it done and therefor gets dropped, it probably wasn’t *that* important in the first place. I’ll check back in with your blog 4/1 to see how that method worked out for you. Please update as you go along. What an awesome idea. I’m obsessed with making lists of things I need to do, and in your same fashion, I end up with paper all over the place and only half of my “chores” done. I think this method will work out really well for me, and I plan on trying it for the next few days. I just hope I don’t forget some of the things I’m supposed to do! For things I really, really felt strongly I might forget, I do put it on a tiny post-it in the page of my notebook (which I have now renamed “The Daily Hustle”). But I’ve had to use that two or three times and mostly just to write down phone numbers of people to call back when I check my voicemail. Honestly, you’ll be surprised to learn that you *don’t* forget the really important things that need doing and that’s it’s own form of prioritization. The little things that didn’t matter much that used to make up the bulk of my list don’t even warrant an entry in my notebook- and I don’t waste time doing unimportant things. Please check back in here or on twitter and let me know how this works out for you if you try it. Not that its groundbreaking or anything, but in Workflowy you can mark items as completed, and they are noted with a strikethrough. You can hide your completed, but I like to keep them visible for the same reason as your post. But you said it very well, accountability. I hadn’t heard of Workflowy- that’s a good plug for people looking for another To-Do list app (that offers the satisfaction of checking items off). Whatever it takes, whatever hack works for you, is the one you should use. Well done. It’s like the people that write down what they’ve eaten that day to be able to go back and say, “Holy crap I’m a pig!” Accountability as well as conscientious. It’s a good solution for those of us that don’t like to be told what to do…even by our own selves. I need to look up where exactly I read this, but in one of my books I am reading it talks about how a few famous hard workers (Winston Churchill was one I think) would either evaluate their days or their weeks at the end of them to see how efficient they were. They’d grade each activity and force themselves to come to terms with whether or not they were really working hard or just messing around and hiding from the fact that they were doing so. Great post and great idea, I’m gonna try and implement those methods this month. Please let me know how it works out for you if you implement the method. I didn’t know that about Winston Churchill, but it makes sense. It’s easy to distract yourself with “busy work” when there is real, tangible work at hand that needs to be done. The great thing about keeping a record of things you’ve accomplished is that, at least in my experience, you tend to weed out the ‘busy’ tasks and only record the things that actually mattered to you that you did that day. In that way, it gets you in the habit of working on ‘big’ things- be it a site, a client project, or just sticking with your workout routine. Whatever matters to you. What a novel idea; using a journal to document what you accomplished in a day. And the lights… come… on. Some ideas just click. This is such an idea. That’s awesome, I’m glad you got something out of the post Brian. Please let me know if you use the method and whether or not it improves your productivity. I can truly appreciate the challenges. I actually work on client projects only about 20 – 30 hours a week, The rest of my time is split (fractured?) between general research, blog reading, article research, article writing, socializing IRL, dealing with physical challenges thanks to asthma, a bad back and serious food/environmental allergies, and finding “me time” in all of that. As an addicted list maker, I can go back to my Franklin Planner and see my completed (and uncompleted) tasks from 1995-2009. In the past 2 years, I’ve been working various methods. I do find, however, that I get an adrenaline rush from checking items off lists and closing tasks. I spend the 1st 1.5 hours of every Monday morning scheduling out my time and reviewing “big rocks” for the week. I schedule appts & block out work times as if they were appts. The same goes for workouts. 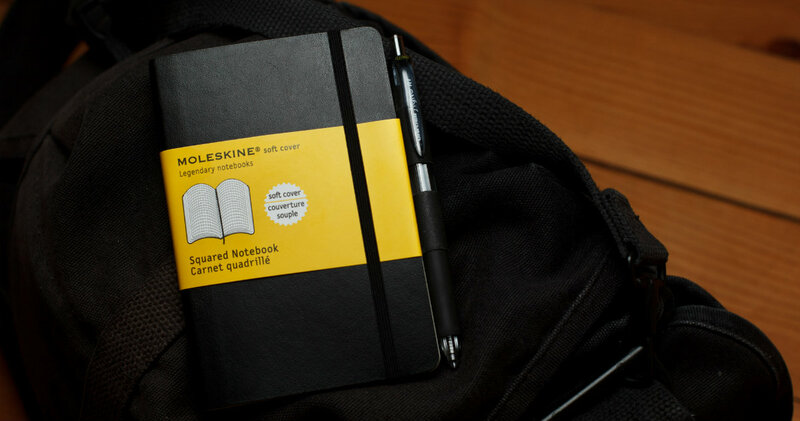 So, from someone who doesn’t have it figured out, I’ve also multiplied my billable hours by following similar methods to you but w/o moleskin – always carry a composition book to capture thoughts and shut down from social media, IM, Skype, email & less socializing. I miss sharing and surely have lower Klout & fewer RTs. But, my clients are happy. I’m going to incorporate more logging of accomplishments and had already marked March as the month to begin Living Documents for each project to document work accomplished. I guess this falls in line with your method to an extent. This is exactly what I am looking for. Do you know of any sites or apps that let you record what you did instead of are going to do? I can’t say I know of any apps that do this specifically. However, you could just use Workflowy.com in this way. Instead of using it to map ideas, check lists, and things you want to do- map it out by day. So, tab 1 would be “May”, tab 2 would be “Week 2”, and the next Tab in would be “Monday”. Then just add everything you’ve done as bullet points below it. You can minimize and maximize the chart at will so- over time- you’ll be able to see how much you’ve accomplished. All in one place. And not on a piece of paper you’re likely to lose. I’m someone who procrastinates by reading about productivity systems and then playing with them so I’ve used tons of apps/systems. This is my first time seeing this idea though, kudos to you! Gunna give it a try.